Part Number WPW10207397 replaces: 4448696, 4452153, 9760766, W10207397. Wall Oven, Microwave Oven Combo, Range. First I don't know why all the other directions omitted the most important step. REMOVE POWER AT CIRCUIT BREAKER BOX. Unless you want to risk 240 volts surging through your body I would strongly suggest this step not to be skipped. Leave breakers off to avoid accidental oven use by forgetful wife. Second, with power removed and oven allowed to cool, pull oven trays out. At the bottom of the oven there are two screws attaching the element to the the back of the oven. Using a #2 Philips Head screwdriver remove the two screws. Gently pull the element out. 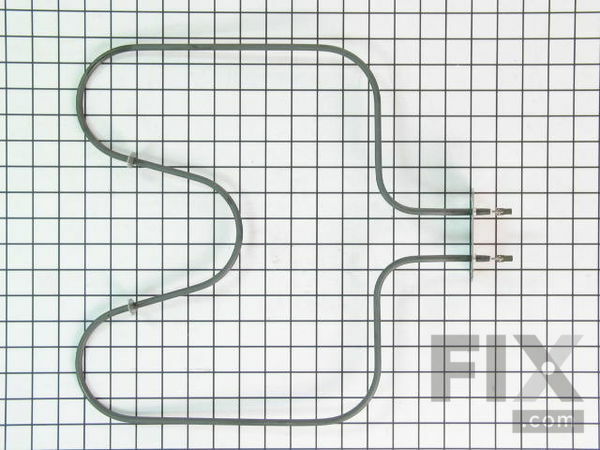 The element is attached to two push-on wires. Gently pull the connectors off element. Remove element. Re-install two screws in attachment holes to not lose screws. Wait for about a week to receive part. Once part arrives removed saved screws. Reinstall the push on connectors of the power wires onto the element. Feed the wires gently back into the back of the oven. Align screw holes of the element attach plate and re-attach the two screws. Close oven door. Reset circuit breakers at the panel. Reset time on oven. Call wife to brag on how you saved her thousands of dollars on a new oven. This took more time to write than the job itself. But really remember to shut off the power. Removed two screws with phillips screwdriver. Then removed two wires that connected to heat element then do the reverse. Was finished in 10 minutes. Turn off the breaker in our electrical panel first ! Removed two mounting screws and unpluged the the element and removed it. Then I plugged in the new element and replaced the mounting screws and tested ,works perfectly now wife is happy again ! Shut off breaker to the oven. Removed two screws which attach the element to the back of the oven. Moved element slowly toward the front of the oven until I could slid the two connectors off the element. Attached the connectors to the new element. Carefully pushed the element with the wires connected back in place. Installed two screws. Closed oven breaker and used a thermometer to check temperature accuracy after the oven heated up. Spent more time cleaning the oven when the element was removed than it took to replace the element. This would have been a very easy job had the screws not been rusted. When I attempted to remove the old screws the head of the screw completely disintegrated. I sprayed it with a lubricant and let it sit overnight then used a pair of vice grips to grab what was left of the screw. Once the screws were removed the rest was an easy job. I have one issue, the replacement element did not come with screws. Make sure to order screws with your replacement part or have some on hand to complete your job. I watched a Youtube video to see how to fix my oven. So happy to see the site had my pieces. I am NOT a handyperson but decided to try it. My son-in-law located the hinge locks and easily pulled those forward. The door lifted out quite easily. I unscrewed all the screws in the door and carefully lifted each part as it came loose. After so many years, the parts were very greasy and dirty. I lifted out the broken glass and disposed of it and, one by one, I just scrubbed all the parts clean. I carefully reassembled the pieces and replaced all the screws. The heating element was a very easy fix. I turned off the power, removed 2 screws that held it to the back wall of oven, pulled the connector wires apart carefully, disposed of old unit, connected new unit like the other one was, replaced screws and "voila!" done.